Carlow Nationalist — You just can’t beat experience! » You just can’t beat experience! You just can’t beat experience! Carlow Walking Football is becoming more and more popular. Every Friday morning at 11am in St Fiacc’s Hall, Graiguecullen a large number of players are involved. Gary Coady, FAI development officer for Carlow, oversees and referees five-a-side games. Most of the participants might be senior citizens, but everyone is welcome to play as long as they stay within the rules. “There is movement, attacking, defending. They are loving it and it is now up to all these guys to go out and spread the word. 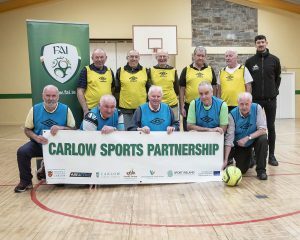 In association with Carlow Sports Partnership and other organisations which caters for sport for older people in Carlow, this form of indoor soccer has caught on. So much so that Coady feels they could approach clubs in the area and possibly run off games on a league basis. It all started in late 2018 and through word of mouth, they have attracted a broad range of players who had different sporting allegiances. Despite a competitive element, the welfare of the players is paramount. “Before we start I have a good chat with the lads, make sure everybody is feeling alright and have a nice warm-up,” says Coady who has seen friendships develop. There is also a forum for younger players who were ill or are recovering from injury to come in and play a little. “In the last few weeks players who have played indoor football into their 40s have come back and the standard is good. It is a challenge for everyone. You just don’t cross the line where people really want to win,” emphasises Coady. Paul Maher has been involved since the games began. He played little sport himself. “The only soccer I played was as a kid on the streets. I have been pushing this for a while,” he said and if Gary Coady tries to minimise the competitive element, then Paul says the players do get emotionally and physically involved. “Sport for older people; it does become competitive,” he smiled. “Especially some of the lads who played before who might be a little bit more robust. The bottom line is that everyone is welcome and everyone who turns up will get plenty of football. “The group is great. No skill level required so join us for a cup of tea, a biscuit and a bit of a chat,” encourages Paul.